Sights in Micheldorf - micheldorf-gvs Webseite! In the year 1045 this church was named first. It is even present in 1867 in the diocese Gurk as a subsidiary of St. Nikolai (Straßburg). Meanwhile it was turned into a warehouse but it is still recognizable as a church. This church was founded upon a fortified prehistoric place where probably once stood a celtic temple. Even today there are traces of an prehistorical rampart in the west and in the north. Later there might have been – according to discoveries from Roman and Teutonian times – a fortress at this place, too. 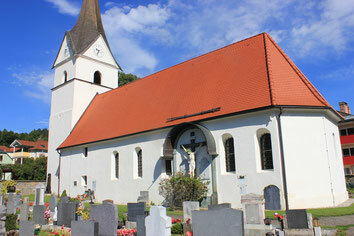 The church of St. Lorenzen was the residence of a priest untill the middle oft he 12th century. The cemetary oft he church was used untill the beginning oft he 20th century. The new church tower was consecrated on October 25th, 1930. For this church which was dedicated to St. Vitus there are letters of indulgence which refer to an expansion. In 1447 the mighty west-tower with its curved steeple was built. In 1738 the church nave was extended. In 1785 Gothic choir was consecrated. On the arch oft he nave there are frescos of Primus Haberl.